MadgeTech announces the release of the new ThermoVault Max extreme thermal barrier as part of the new DHS Data Logging System for dry heat sterilization. This rugged all in one system is designed for the harshest high temperature environments. The system includes a HiTemp140-M12 high temperature data logger with a 36” glass braided RTD depyrogenation probe, and the brand new ThermoVault Max thermal barrier enclosure. This system out performs other dry heat sterilization loggers with unparalleled time versus temperature capabilities. Designed to withstand and operate in temperatures up to 400 °C, this system accurately measures and records throughout the entire depyrogenation process. Dry heat sterilization, or depyrogenation, is a sterilization process that is widely used for items that are moisture sensitive; including glassware, swab-sticks, all glass syringes, and basic pharmaceutical products. This sterilization method is also the only option for anhydrous fats, oils, powders, and metals that may be at risk for corrosion. Additionally, this method is non-toxic and therefore doesn’t harm the environment and the dry heat cabinet is easy-to-install and budget-friendly. The ThermoVault Max extreme temperature thermal barrier is designed for use with MadgeTech’s HiTemp140-M12, HiTemp140-FP and HiTemp140-PT data logger models. This durable enclosure is made from stainless steel with PTFE insulation and can withstand temperatures up to +400 °C in dry heat applications and +250 °C for wet applications when used with the TMAX Wet Seal Kit (sold separately). This versatile enclosure provides a best-in-class solution for the harshest of applications. 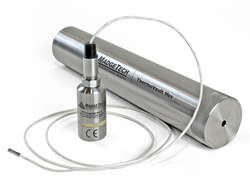 Designed to endure extreme temperature monitoring environments such as furnace profiling, geothermal down-hole recording, oven data logging and more. MadgeTech data loggers, probes and enclosures are all available for individual purchase, but the components of the Dry Heat Sterilization Data Logging System have been carefully designed and combined to create the ideal solution for dry heat sterilization process monitoring. The stainless steel design of MadgeTech data loggers offer long term performance which is complimented by the MadgeTech Data Logging Software, which is packed with a multitude of reporting and sterilization specific features. Sterilization professionals will benefit from the automatic calculation of F0, a complex calculation that determines the correct amount of exposure time required before a product can be considered sterile. Contact MadgeTech's technical sales team today to guide you to the perfect solution for your organization, or visit MadgeTech's website to learn more. Keep up with industry news by following MadgeTech on LinkedIn and Twitter pages.